As a schoolgirl, I was probably the most patriotic I’ve ever been. I would participate in all the Independence Day activities – performing in the tableaux and skits, singing mili naghmay and making speeches about my love for Pakistan and our struggle for independence. It came from the heart, pure of any doubts and grudges. Times have changed, and after 9/11, my country and countrymen began to face problems we never thought we would. Last night, I decided to revive that fading enthusiasm to celebrate August 14 by looking at dog-eared photographs of my school days. I would wear no less than two flag badges and flag-coloured clothes. My friends and I would be tangled in jhandiyaan, decorating our school and even homes. I decided to going on a mili naghmay spree and as soon as it ended, I knew I was going to go buy a flag, a badge, and wear the greenest green I could find in my closet to work the next morning. Here are some of the songs that helped me rejuvenate the passion I’ve had present, but hidden in my heart all these years. 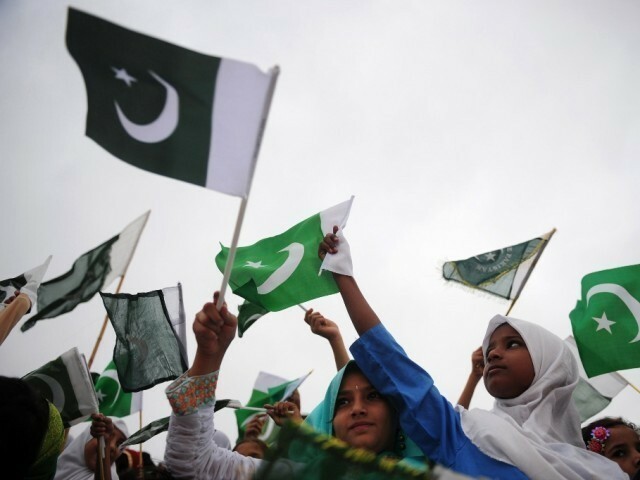 Listening to “Mera Inaam Pakistan” reminds me of standing in the crowd early in the morning in my neatest white clothes before the August 14 function started. It was kind of a warm-up. We would wave the flags in our hands with the rhythm of this evergreen melodic work of Ustad Nusrat Fateh Ali Khan. Then, of course, no August 14 function would be complete without legendary Mohammad Ali Sheikhi’s “Main Bhi Pakistan Hoon, Tu Bhi Pakistan Hai”. This song not only gives us a boost of patriotism, but also almost injects in us a sense of brotherhood, unity and equality. The line “Dharkan hai Punjab agar, dil apna Mehran hai“ (If Punjab is the heartbeat, Mehran is the heart) is especially my favourite. In times when provincial unity seems has weakened a little, this song is a powerful reminder of how we greatly believed that we are all brothers in arms. Before we could even utter most words properly, we knew this one line from a national song: “Jeevay, jeevay, jeevay Pakistan”. I remember being in nursery and singing just the “jeevay jeevay” part with my classmates as “seniors” from grade three sang the difficult stuff. I especially chose this video from the internet because I can relate to it the most, with all the children standing in proud, singing for Pakistan. I will never forget being a part of it. It is not just a song but a prayer, as it translates to “long live Pakistan”. Next on my playlist was the new version of Mehdi Hassan’s “Yeh Watan Tumhara Hai” – again, a reminder of our responsibilities towards the nation. “This country is yours, you are its pasbaan (defender)”; I did not know what ‘pasbaan’ meant literally, but the way it was sung told me I was to stand by my countrymen and fight for Pakistan if need be. It told me that Pakistan is sacred. When the movie Jinnah came out, we were all struck by a beautiful re-enactment of what our ancestors went through to achieve their dream of Pakistan. Unfortunately, I could not find the Jinnah version video of this song. It opens with “Tanzeem Ittehad Imaan”, (discipline,unity, faith) the strongest message of the founder of Pakistan – Quaid-e-Azam Muhammad Ali Jinnah. This song never fails to instil an overwhelming emotion in me – a feeling of sheer gratitude towards my ancestors. I saved my favourite for last. This song makes me the happiest, like most Pakistanis I’m sure! It is easily the most popular mili naghma. Thank you for this, Vital Signs! You brightened up our lives with this modern, totally cool take on national songs. Every Pakistani I know has naturally learned it by heart. Dil Dil Pakistan is a timeless, almost global tune, and it can still make us all stand up and ‘enjoy’ independence as we did in the nineties. I have many, many more national songs which I love. One blog post will not be enough so I will sadly have to end the list here. I hope these songs have made you feel the way I do as I write this, wearing my crazy, flag-green pants to work that I wouldn’t sport otherwise. Jashn-e-Azaadi (independence day celebrations) began in my heart last night and I hope that it lasts for as long as I live. What a beautiful compilation Imaan. A true labour of love. I really enjoyed listening to all these songs and also reading the emotions you attached to each one. I was familiar with 2 of these Jeeves Pakistan and Dil Dil Pakistan. Besides these 2 songs, usually on 14 August our local desi radio station in Dallas plays Jazba Junoon. But I was not familiar with the other songs. Thank you for sharing. You and I are blessed to be born in free countries and we should cherish this freedom and not take it for granted. thanks Imaan! you are right…the love for Pakistan is always in our hearts..